“Gravity Assist,” a new NASA weekly podcast series, launches Wednesday on NASA.gov and the SoundCloud and iTunes audio platforms. This initial 10-part series, with plans for future episodes, features top scientists from around the world guiding listeners on a tour through our galactic neighborhood as they explore the wonders of the solar system and beyond. The inaugural episode features Parker Solar Probe project scientist Nicola Fox of the Johns Hopkins Applied Physics Lab, who discusses the Sun and the mission. The goal of “Gravity Assist” is to give the public a more in-depth, personal and engaging look at the science and people behind NASA missions. This series will consist of lively conversations about some of the top mysteries in space science with many of the world’s leading scientists. The title refers to the term “gravity assist,” which describes the slingshot effect a spacecraft gets when it uses the gravity of a planet or another object to speed up or alter its course. This introductory series will start with the Sun, followed by new segments each week on Mercury, Venus, Earth, Mars, Jupiter, Saturn, the ice giants Uranus and Neptune, and Pluto. Future installments of the series will explore other science topics throughout the universe. 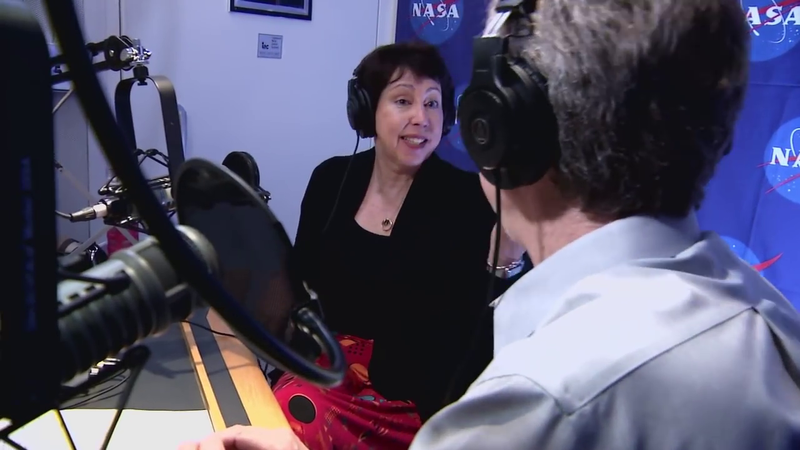 Parker Solar Probe Project Scientist Nicky Fox of the Johns Hopkins University Applied Physics Lab is interviewed at NASA Headquarters about the Sun and the mission for the new “Gravity Assist” podcast that launched Nov. 15, 2017.